With an order of 27.000 pieces the Marine Corps of the United States of America is preparing to retire the assault rifles of the M-16 / M-4 series. To succeed him will be an interpretation of the previous M-4 rifle, or the German Heckler & Koch 416 (photo), already adopted about ten years ago to support MINIMI in the role of Infantry Automatic Rifle (IAR). The 416 has an architecture very similar to the M-4 rifle, even if the mechanical parts differ, as the German assault rifle uses, as a system for the recovery of gas, a short stroke piston, in place of that Direct Impingement of the M-4 series. Furthermore, in the field of precision rifles, the 2019 will see the definitive introduction of the M-110A1 weapon system (pictured below) of the Knight's Armament, in the 7,62x51 caliber, semi-automatic weapon to be assigned to expert shooters within the riflemen's team . 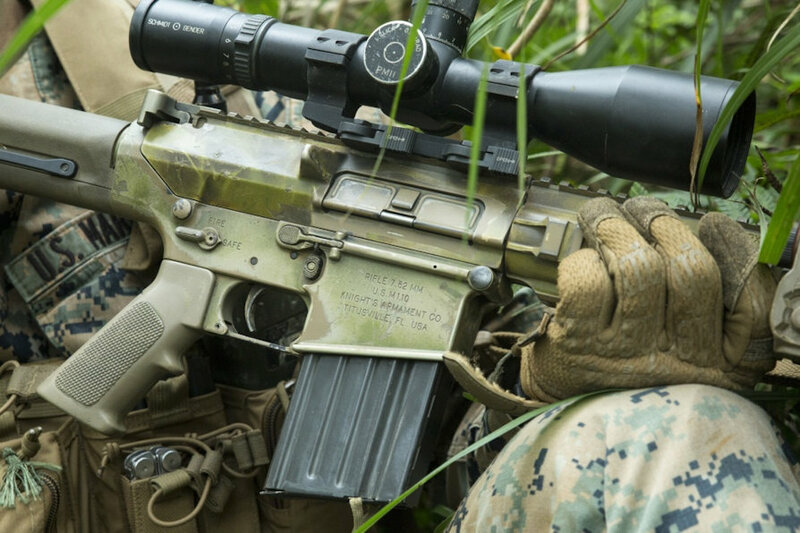 As is known, the Marines have always given great importance to precision shooting, therefore, the adoption by the USSOCOM of the 6,5 caliber Creedmoor (6,5x49) for sniper weapons will allow body shooters - thanks to the modularity of the M-110A1 - to quickly switch to the new caliber.